Photo: Courtesy of Sahar Knows Best. Mixing prints is an art. Correct execution can produce a masterpiece of an outfit; bad execution, however, could have you looking like a closet Dumpster-dive. But, if you're ready to tackle this trend, there are a few guidelines, courtesy of Teen Vogue. If you tend to shy away from pattern pairings, there’s a simpler, less intimidating solution: Mix one print in two colors, says the publication. There's no need to couple florals with plaids and polka dots with houndstooth if the idea freaks you out — leave that to the fearless. The idea behind this approach is to look cool, not crazy, so keep the rest of your outfit neutral. 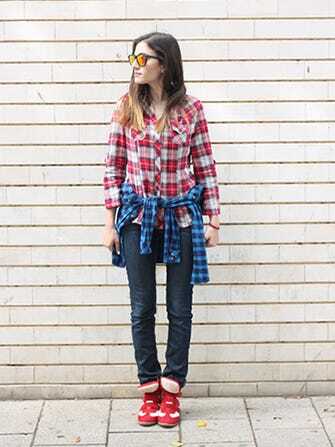 For example, anchor it with a solid blouse, a pair of jeans, or simple booties.